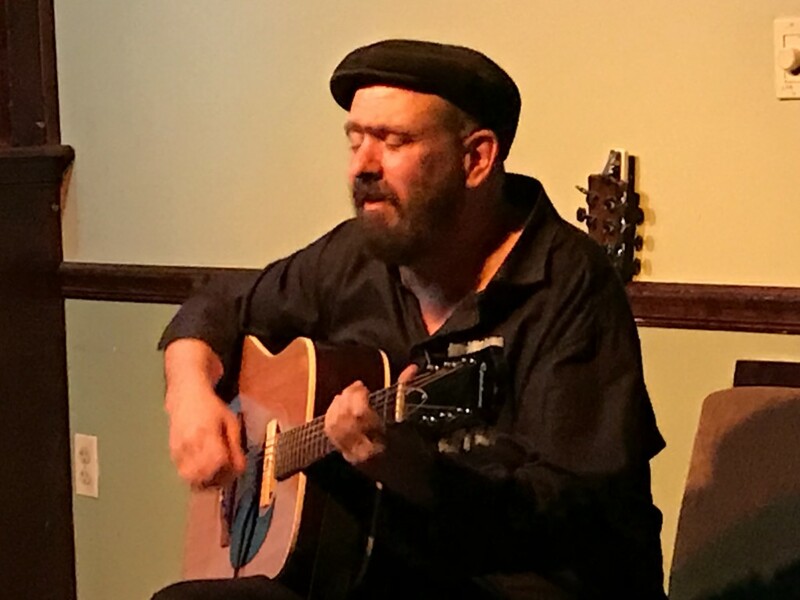 It was billed as a living room concert, and the entire Mark Eitzel tour dubbed “Living room Tsunami” so it was a little bit surprising when the secret D.C. area location, once payment was made, turned out to be an Irish bar in Wheaton, Md. It could have been another barroom show except that the house concert vibe prevailed – a rapt, absolutely silent crowd hanging on his every word; even the bartenders refraining from clinking glasses or turning on blenders for the duration of the early evening performance. Eitzel for his part began the show in comfortable chair surrounded by a couple of guitars, a rug at his feet, by switching on the stage lights himself from a wall switch behind his head. From there, he dived into the kind of soulful, expressive singing that marked his work since the days of the American Music Club. He said he’d only been on the tour for a week but already missed his dog, hence an apparently new song about a canine early in the set. If there was a thread that continued through the set it was a powerful wistfulness that he dismissed as same-sounding sad songs, in his self-effacing way. It all comes from an early ambition to become Ian Curtis of Joy Division, he said. Eitzel, born in California and long a denizen of San Francisco, lived for a bit in London. But he felt at home with his guitar and songs in his comfortable seat, though he couldn’t properly do an encore because there was no stage to leave and return to. More the artist than the personality, he never even hyped his merchandise, sitting forlornly on a side table.